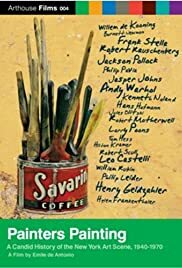 The definitive documentary on the New York School Painters. Featuring footage of all the major figures of the New York Art Scene between 1940-1970, showing many of the artists before they became famous. Films I saw whilst at Art school. A portrait of New York artist Keith Haring. A candid history of the New York art scene, 1940-1970. I ended up doing a degree in Fine Art. Now I've come full circle and work as a "commercial" artist in the film industry making visual effects for movies. I still recall this film fondly - it captured something of what got me excited about making art in the first place. Emile De Antonio made several other films which are worth watching - I wouldn't be surprised if he is rediscovered given the current popularity of documentary film making.